This summer, I thought I would try something new when it comes to planning our family's meals. I decided that I would plan our dinners for the month. To save money. While menu planning for a week does manage to save us some money by ensuring I have some idea of what to make when the dinner hour rolls around. Which definitely helps in resisting the urge to hit speed-dial and order our favorite take-out items. But with the weather being nice and Grace wanting to spend more time outside, I'm having trouble finding the time to plan out a new menu each week, let alone follow it through. By having a month's worth of dinner ideas posted, I'm hoping I'll be able to keep on track while chasing Grace around the yard! Try new recipes. I have a huge list of new recipes I want to try. I usually save them in an email file, scribble them in a notebook or pin them (Isn't Pinterest wonderful?). But once they are filed, scribbled or pinned, they are often forgotten. Since Grace was born, I have such a short attention span, it's ridiculous! I figure if I add them to each new month's menu plan, I have a better chance of remember the new recipes...and hopefully trying them! 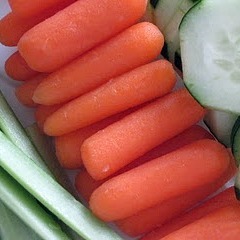 With those two points in mind, my goal is to look for/plan healthy and frugal meals. We're trying to eat healthier (I'm joining a new weightloss challenge on Monday) and I want to get back into the habit of cooking with more vegetables. I also want to incorporate more beans into our diets. Lima Beans and Ham over Rice. 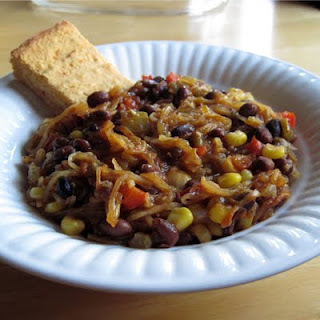 I'm really looking forward to trying this frugal recipe using rice and beans. While I don't have a ham hock, I'll be using a ham steak from my freezer. I'll just have to add dry lima beans to my shopping list! I love that The Southern Lady Cooks shares the cooking times for both stove-top and crock-pot cooking! Zesty Crock Pot BBQ Chicken Sandwiches. I love when I have all the ingredients on-hand when I find a new recipe that I want to try! I have open bottles of both the dressing and sauce on the refrigerator door...maybe I can finish them up and free up some space on the door! Wouldn't that be nice? I'm thinking some corn on the cob and grilled potatoes would be tasty served with these shredded chicken sandwiches. I haven't ventured too far into the Prickly Banana's blog, but what I've seen so far, I think I'll be spending a lot of time over there! Hot Dogs, Baked Beans and Grilled Potatoes. During the summer, we like to keep hot dogs in the freezer at all times. Baked Beans, too. Although we eat hot dogs and beans all year, there's something extra special about a hot dog cooked on the grill with a big bowl of baked beans on the side! 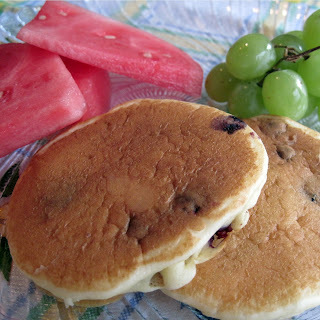 It's summer-time comfort food! Grilled potatoes replace the traditional baked potatoes that we normally serve during the winter. I'll tell you more about them in another post. Blueberry Pancakes, Turkey Bacon, Fruit Salad. Breakfast for dinner is always a hit...at least for me and Joe. Grace tends to be a bit pickier. I'm sure it's punishment for when I was kid and refused to try anything new. Anyway, I can usually get her to eat a pancake or two. So, this will be one night that I won't have to prepare something separate for Grace. I like those nights! Balsamic Chicken over pasta. I found this recipe while checking my email over the weekend. It was sent to me by my husband! Joe generally eats whatever I put in front of him and rarely makes requests for dinner, so he must really want to try this recipe to send it to my inbox! I have to admit that after checking it out, I'm really wanting to try this, too! Especially because it's a crock pot recipe! Buffalo Chicken Wraps, raw veggies. 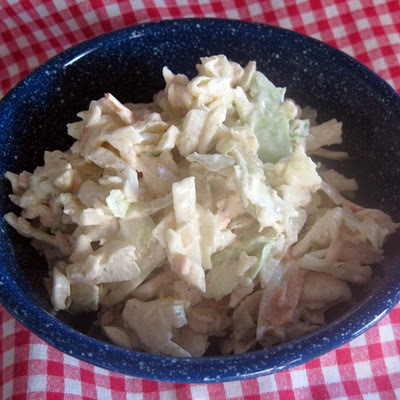 Here's another recipe from Debbi! We love buffalo chicken and we love wraps! So, I am sure this meal will be a hit! 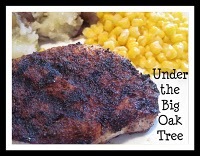 I might make this and invite our nephews over for dinner...they love foods made with hot sauce! Corn Dog Casserole, fried or grilled potatoes. 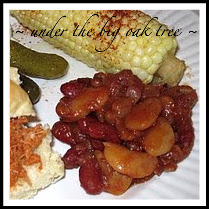 I'll make this meal using leftovers from our hot dogs and bean dinner. 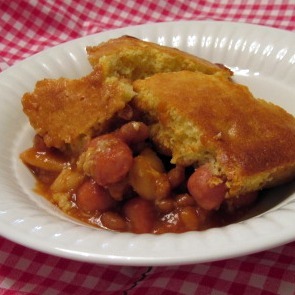 It's super-easy to chop up the leftover hot dogs and mix them into the leftover baked beans. Top with corn bread batter and pop into the oven! Yum! "Skinny" Arroz con Pollo. I stumbled across this blog by accident, but after hearing the name, I was hooked and started browsing while watching TV. Fake-it Frugal, is a great site for tips and tricks for saving money. Since our grocery budget can always use some help, I decided to add this chicken and rice recipe to our menu plan. And since my "diet" is also in need of some serious help, I love the fact that this is a "skinny" recipe! Heather suggests doubling the recipe to "make 1 and freeze 1" but since the recipe yields 12 servings and it's just the 2 of us, I'll freeze half! Pesto Orzo. This is an old favorite of ours, though it's been forever since I've made it. In fact, I don't think I've made it since we've moved into this house almost 5 years ago! But since I'm looking to add more veggies to our meals, this recipe is definitely the way to go! I'll share more details as soon as I make it...since I don't have a photo or exact measures of the ingredients at the moment. Cauliflower Rice, Pork chops, salad. All week, I've been searching for healthy recipes on Pinterest. Somehow, I stumbled across this recipe over at Elana's Pantry. Joe loves cauliflower, so I'm thinking this healthy recipe will be a hit. Roasted Poblano Pepper Corn Chowder. I love corn chowder. I make it often and it's rare that I make it the same way twice. When I saw this corn chowder that called for roasted poblano peppers over at Knead to Cook, I knew I wanted to make it soon! I cannot wait wait to taste it! 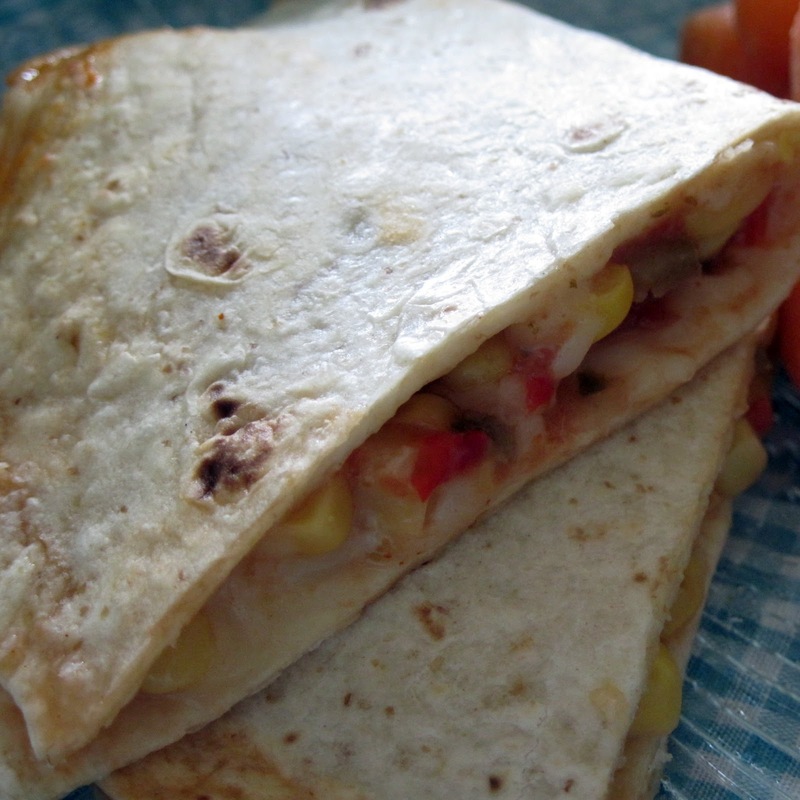 Corn and Black Bean Salad and Quesadillas. This is the perfect meal for those days when it's too hot for a big, heavy meal and the leftovers will be great for lunch! I bet that salad would be tasty as a dip, too! mmmmm! Leslie's Chicken. I haven't decided what I'll make to serve alongside this bacon-wrapped chicken. Maybe if I time it right, I'll have some leftovers to serve with it. If not, a nice big garden salad would be tasty! 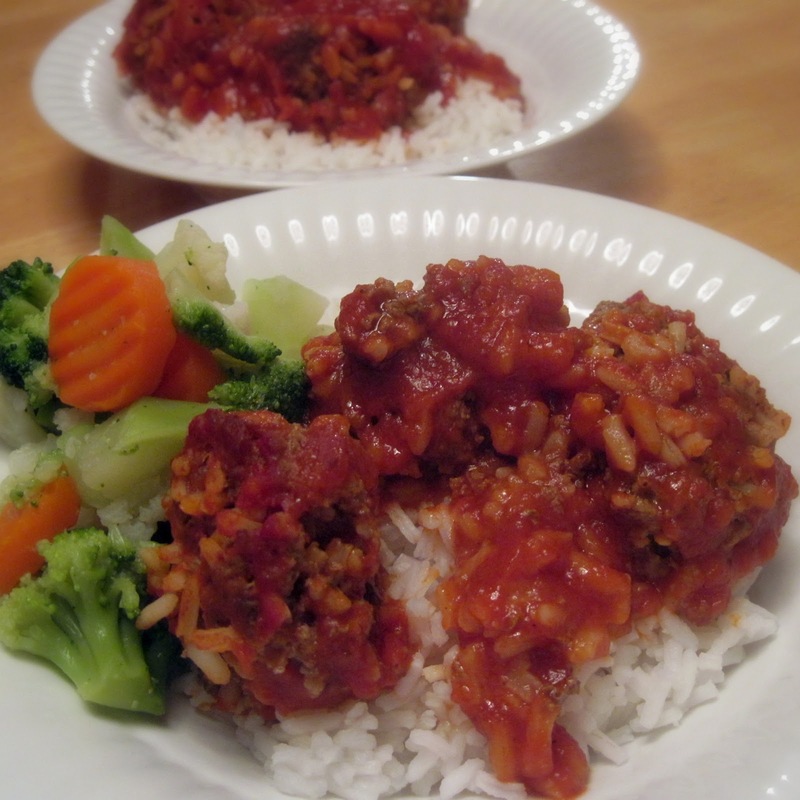 Porcupine Meatballs over rice, steamed veggies. 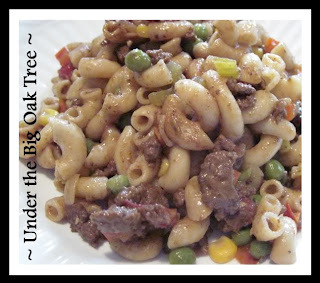 I have all the ingredients and the pantry for this recipe, I even have the ground beef in the freezer! Earlier in the week, I purchased a 5 lb. package of ground beef. Before I pre-cooked the meet for the freezer, I set aside a pound just for this meal. Spicy Shredded Beef in the crock pot. If I find a sale on roasts, I'll make this recipe. This will be a good meal to plan for when we're having company since I think it will be a bit much for the two of us. OR, I could just freeze the leftovers for future dinners. So that's some of the meals I'm planning to prepare this month. You can see I didn't plan out 30 different meals, instead, I just picked 18 meals. This will allow for spur of the moment changes. You know, when you see something on Pinterest and just can't wait to try it! Also, I figure there will be several no-cooking nights this month: Leftovers, dinner with friends, the rare dinner out. Alison, You have some great recipes! I was just looking at your post for CORN DOG CASSEROLE and it looks just fabulous!!!!! I am certainly going to make this one!! !